Native Hawaiians still make up some 38% of the population of Hawaii but most of them have mixed ancestry nowadays. This new study may help to understand them better and also includes some interesting findings about the overall origins of Polynesians, whose Melanesian ancestry is revealed as very significant. 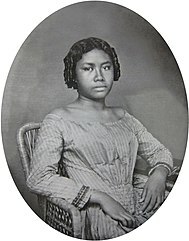 The population genetic structure of Native Hawaiians has yet to be comprehensively studied, and the ancestral origins of Polynesians remain in question. In this study, we utilized high-resolution genome-wide SNP data and mitochondrial genomes of 148 and 160 Native Hawaiians, respectively, to characterize their population structure of the nuclear and mitochondrial genomes, ancestral origins, and population expansion. Native Hawaiians, who self-reported full Native Hawaiian heritage, demonstrated 78% Native Hawaiian, 11.5% European, and 7.8% Asian ancestry with 99% belonging to the B4 mitochondrial haplogroup. The estimated proportions of Native Hawaiian ancestry for those who reported mixed ancestry (i.e. 75% and 50% Native Hawaiian heritage) were found to be consistent with their self-reported heritage. A significant proportion of Melanesian ancestry (mean = 32%) was estimated in 100% self-reported Native Hawaiians in an ADMIXTURE analysis of Asian, Melanesian, and Native Hawaiian populations of K = 2, where K denotes the number of ancestral populations. This notable proportion of Melanesian admixture supports the “Slow-Boat” model of migration of ancestral Polynesian populations from East Asia to the Pacific Islands. In addition, approximately 1,300 years ago a single, strong expansion of the Native Hawaiian population was estimated. By providing important insight into the underlying population structure of Native Hawaiians, this study lays the foundation for future genetic association studies of this U.S. minority population. Figure 1. ADMIXTURE clustering of Native Hawaiians for K = 5 (A) and K = 6 (B). Figures 1A and 1B illustrate the clustering of Native Hawaiians and HGDP samples based on GWAS data. This appears to show rather unmistakably that Hawaiians (and by extension surely also other Polynesians, very close in genetics and history across the Pacific Ocean) have an important amount of Melanesian genetics, consistent with the “Slow Boat” model and the relevance of Melanesian Y-DNA haplogroup C2a among all Polynesian populations. See also in this blog: The genetic and phenotype complexity of the Oceanic language area. Dorian K. Fuller et al., Across the Indian Ocean: the prehistoric movement of plants and animals. Antiquity 2012. Freely accessible. I strongly recommend full reading as I can only dedicate some space here and the study, while not really long, covers many diverse aspects of plant and animal domestication and translocation around the Indian Ocean. 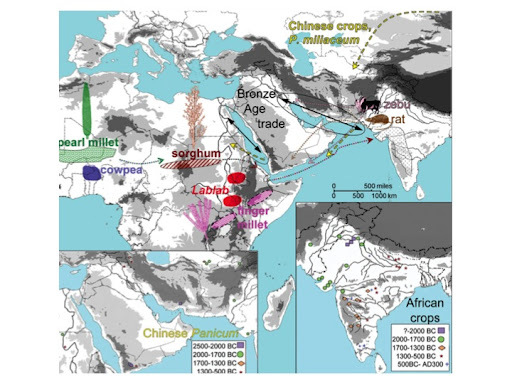 First the authors deal with the issue of how the most important tropical crops of South Asia, which are mostly of African origin, arrived there. They conclude that the transfer took place at the very end of the Harappa (IVC) period, rather than earlier, even if it is confirmed that Harappa and the Persian Gulf (but not yet East Africa apparently) kept trading relations since much earlier. These African crops (millet and sorghum specially) were critical, as we know, in enabling the expansion of farming towards Southern India. In return India gave Africa the zebuine species of cow, which, after hybridization, fueled the expansion of East African pastoralists into Equatorial areas. The first hint of this spice trade comes from the findings of valued black peppercorns that were used to fragrance the nostrils of the deceased Pharaoh Ramses II (c. 1200 BC) (Plu 1985). This spice is endemic only to the wet forests of southern India (Asouti & Fuller 2008: 47), and in all likelihood was supplied by hunter-gatherer groups to coastal groups (Morrison 2002). 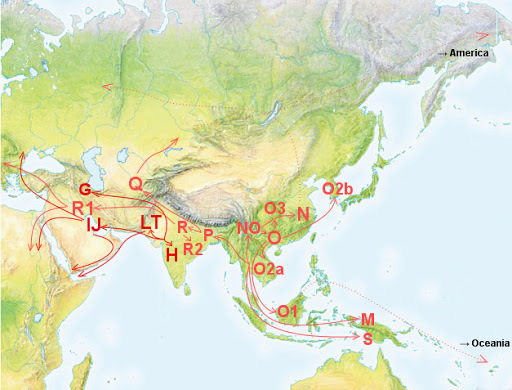 Another section deals with the transfer of diverse crops between South and SE Asia (and even as far as New Guinea). 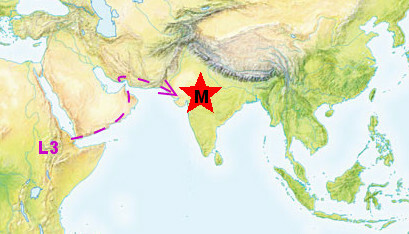 Indian pulses migrated to the East, while a number of other crops (areca nut, sandalwood, betle leaf and maybe banana) did in the opposite direction. The origin of mangos and lemons is also discussed and seems distributed between both regions. 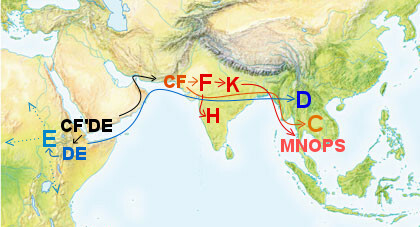 Many of these flows may have been from approximately the same time as the African-Indian connection, in the late 2nd millennium BCE. Finally a third layer of agricultural flows appear to connect SE Asia with Africa, the most notable being the banana, but also yams, taro and chickens. This one seems most likely related to Austronesian (Malay) flows in westward direction, leading to the formation of the Malagasy people and the colonization of Madagascar. In their journey westwards, the proto-Malagasy appear to have left some maritime vocabulary in Sri Lanka, SW India and the Maldives, where they also left their outrigger technology. A variant of this one, with two outriggers, is also widespread through East Africa, from Somalia to Mozambique and, of course, Madagascar. 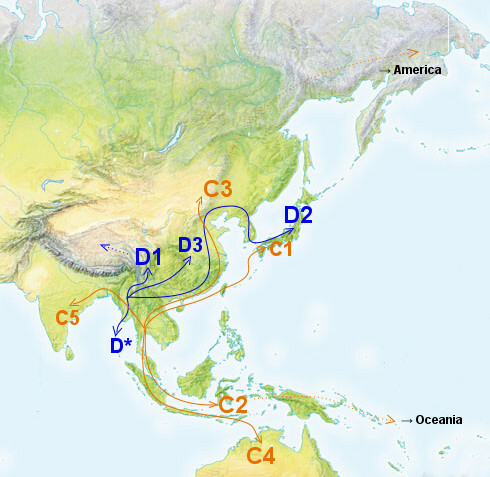 The Austronesians would have spread these crops and the chicken to Africa, bringing also possibly some commensals like the rat, the mouse and the Asian shrew, as well as a weed. Some of these may however been introduced in several episodes. Eimear E. Kenny et al., Melanesian Blond Hair Is Caused by an Amino Acid Change in TYRP1. Science 2012. Pay per view. Actually natural blond hair is also found in West and Central Asia and North Africa, and red hair even in the Horn of Africa now and then. But I guess that’s what the authors mean by “Europe”, duh! It’s also found occasionally among South Asians, specially the young, and among SE Asians regardless of age. 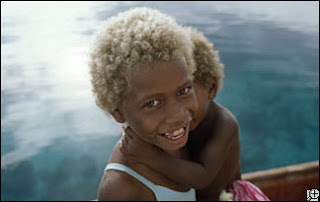 Whatever the case with the authors ethno-geographic misconceptions, the results are still most interesting: the gene causing blond hair among Melanesians (and some relatives like Fijians) is not the same as those involved in blond hair in Europe. Mind you that it is not clear yet which are these European genes of blondism but it is clear that the Melanesian allele is not it either. There is also an article at New Scientist. Neanderfollia mentions today[cat] new genetic research that has found unusual diversity in gene OAS1 among Papuans. They contend that this is caused by extremely old introgression that they estimate in more than three million years (more than the age of the genus Homo). Fernando L. Méndez et al., Global genetic variation at OAS1 provides evidence of archaic admixture in Melanesian populations. Molecular Biology and Evolution 2012. Pay per view. Recent analysis of DNA extracted from two Eurasian forms of archaic human show that more genetic variants are shared with humans currently living in Eurasia than with anatomically modern humans in sub-Saharan Africa. 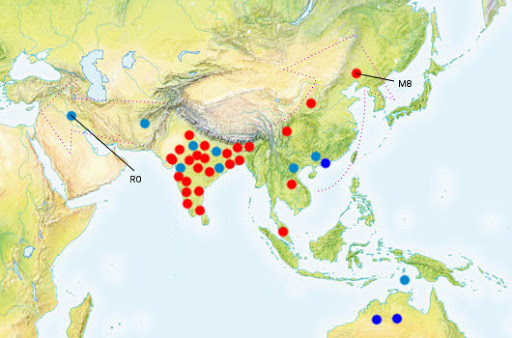 While these genome-wide average measures of genetic similarity are consistent with the hypothesis of archaic admixture in Eurasia, analyses of individual loci exhibiting the signal of archaic introgression are needed to test alternative hypotheses and investigate the admixture process. Here, we provide a detailed sequence analysis of the innate immune gene, OAS1, a locus with a divergent Melanesian haplotype that is very similar to the Denisova sequence from the Altai region of Siberia. We re-sequenced a 7 kb region encompassing the OAS1 gene in 88 individuals from 6 Old World populations (San, Biaka, Mandenka, French Basque, Han Chinese, and Papua New Guineans) and discovered previously unknown and ancient genetic variation. The 5′ region of this gene has unusual patterns of diversity, including 1) higher levels of nucleotide diversity in Papuans than in sub-Saharan Africans, 2) very deep ancestry with an estimated time to the most recent common ancestor of >3 million years, and 3) a basal branching pattern with Papuan individuals on either side of the rooted network. A global geographic survey of >1500 individuals showed that the divergent Papuan haplotype is nearly restricted to populations from eastern Indonesia and Melanesia. 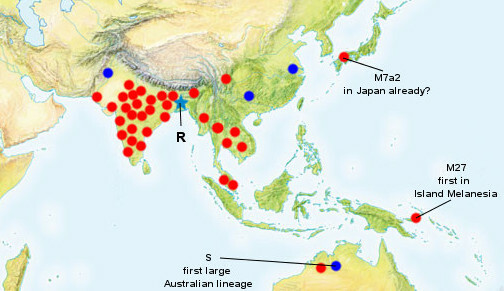 Polymorphic sites within this haplotype are shared with the draft Denisova genome over a span of ∼90 kb and are associated with an extended block of linkage disequilibrium, supporting the hypothesis that this haplotype introgressed from an archaic source that likely lived in Eurasia. This is what I have been arguing since December 2010: “denisovan” admixture in Australasian and SE Asian aborigines stems from Homo erectus (diverged from our line at least 1.8 Ma ago) or even maybe a most distant cousin (maybe H. floresiensis, argued by some to be more archaic than H. erectus in key elements like the wrist or toes). Yet I am a bit skeptic of the age estimate, because, unless the H. floresiensis australopithecine hypothesis could be confirmed, the date is out of bounds for Humankind proper and creates many conceptual challenges, which are admittedly hard to swallow. While the “australopithecine hobbit” hypothesis would fit this scenario, it remains hard to swallow that the two genus would still be inter-fertile just a few dozen millennia ago and then again, why would archaic admixture come from this remote relative and not the much closer H. erectus, which we know lived in East Asia until rather recently. Finally I am in general very skeptic of age estimates as such and their ability to be able to inform more than they confuse. Normally I find them too recent but the opposite (too ancient) can also happen, I imagine. They are in any case just estimates: educated guesses and nothing else. South East Asians and Oceanians. 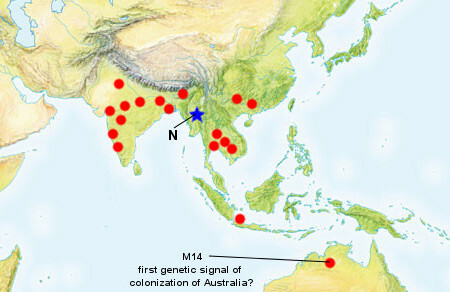 I find particularly notable that the haplotype has been found at very low frequencies in South Asia and nowhere else West of Wallace Line. It can be backflow but may also be indicator about the possible location of the admixture event. Certainly nothing seems to suggests in these or other maps (1, 2) of “Denisovan” admixture that the episode could have happened in Altai or nearby areas as some readers, stubborn proponents of obsolete migration models, have insisted on. 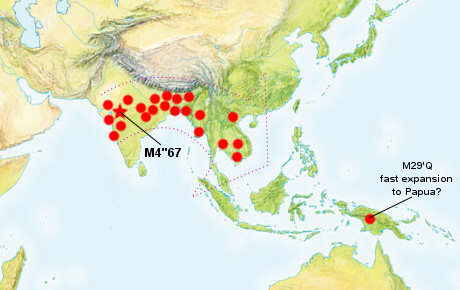 Instead all the evidence suggests that the admixture episode happened in SE or otherwise Tropical Asia, whether deep in Indonesia or more towards the mainland is debatable indeed. Explaining ‘Denisovan’ and also ‘Neanderthal’ admixture: the simplest scenario (where I first hypothesize that H. erectus and also maybe a relative of Neanderthals like the Hathnora hominin, could be the actual culprits). Minimal Denisovan admixture in SE Asians. ‘Denisovan’ admixture may actually be from H. erectus.